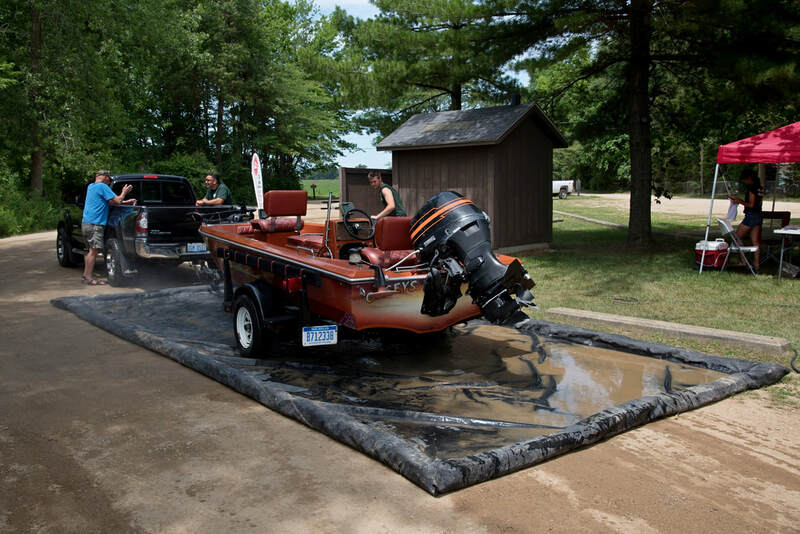 As the end of the 2018 boating season approaches, your Klinger Lake Association Board of Directors felt that an update on the lake environment would be valuable for all residents given the very unusual conditions we all experienced this summer. Many of you have expressed concern over early season fish kills, the presence of fresh water jellyfish1, drought followed by large rains, abnormal winds, and an extraordinary volume of algae in the lake, along with other threats to our beautiful environment. Some homeowners have dealt with ‘scum’ or ‘slime’ on their docks and shorelines unseen in decades. The KLA has heard and understands your frustrations. The volunteer members of the KLA board rely on information provided by the Michigan Lakes Stewardship Associations (www.mymlsa.org), a state-wide non-profit organization dedicated to preserving inland lakes in Michigan, to guide us in our stewardship of Klinger Lake. Members of the board attend conferences to learn about invasive species (both plants and animals) and how to deal with them. We implement monitoring programs as part of the Cooperative Lakes Monitoring Program (micorps.net/lake-monitoring) to identify long term changes in the lake. Among the protocols we’ve implemented in past years have been the Exotic Aquatic Plant inventory (2015) and an MSU sponsored ‘snorkel survey’ in 2016. These involve many hours of data collection (a ‘rake survey’ every 1000 feet of shoreline), analysis and reporting. Every year, we implement the transparency, Chlorophyll and Phosphorus checks. We take all these actions to do everything we can to preserve and protect Klinger Lake. Additionally, for decades, the KLA has worked with authorized contractors to treat invasive plant species. 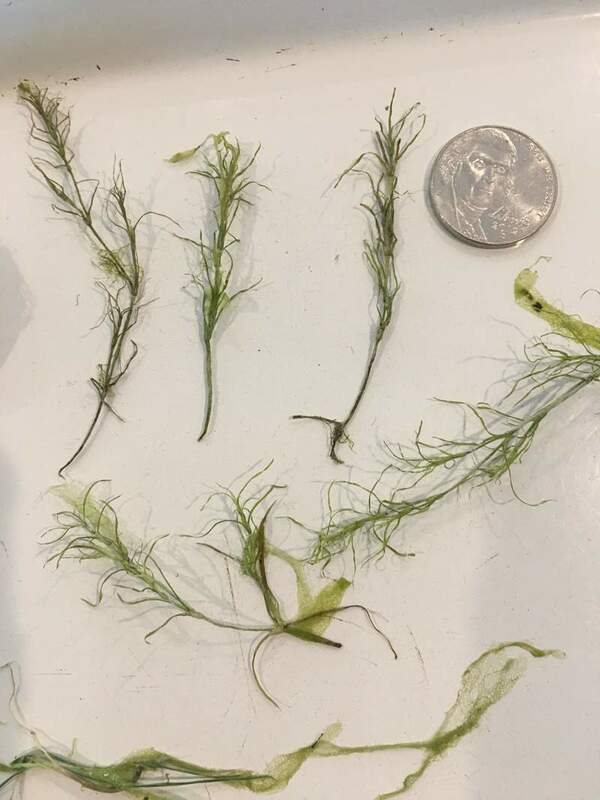 Our current contractor, Aquatic Weed Control (www.aquaticweedcontrol.com), has been our partner for the last 7 years in treating Eurasian Water Milfoil and Starry Stonewort, the two non-native weeds which we’ve identified in Klinger Lake. Thanks to years of diligence, we apply herbicides to less than 1% of the acreage of our lake, providing extraordinary savings to our residents while effectively managing invasive weeds. In comparison with numerous similar lakes in Michigan, our weed control expenditures are but a fraction of many of our neighbors. Aquatic Weed Control is a Michigan Department of Environmental Quality (MDEQ) certified company with licensed employees. A part of KLA’s annual costs for weed treatment is the permit from the MDEQ for the use of herbicides. More information on state regulations regarding treatment of lakes’ invasive plants can be found at https://www.michigan.gov/deq/0,4561,7-135-3313_3681---,00.html. Based on the advice of state and national experts on lake management, our focus is on non-native (or invasive) plant species. Naturally occurring native plants are always present in the lake and are essential to the lake habitat, and cyclical weather patterns impact the presence and volume of both plants and animals. The experts with whom we work recommend no chemical treatments of native plants and algae. 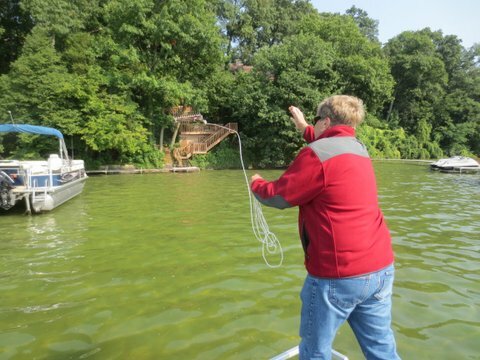 According to one lake consultant who works with over 90 lakes in lower Michigan, 2018 produced ‘a bumper crop of algae’ in most of the lakes she manages. She attributes this to the fact that much of the rain came in large volume events. This caused abnormally high runoff of nutrients which resulted in increased amounts of algae and quick growing plants. 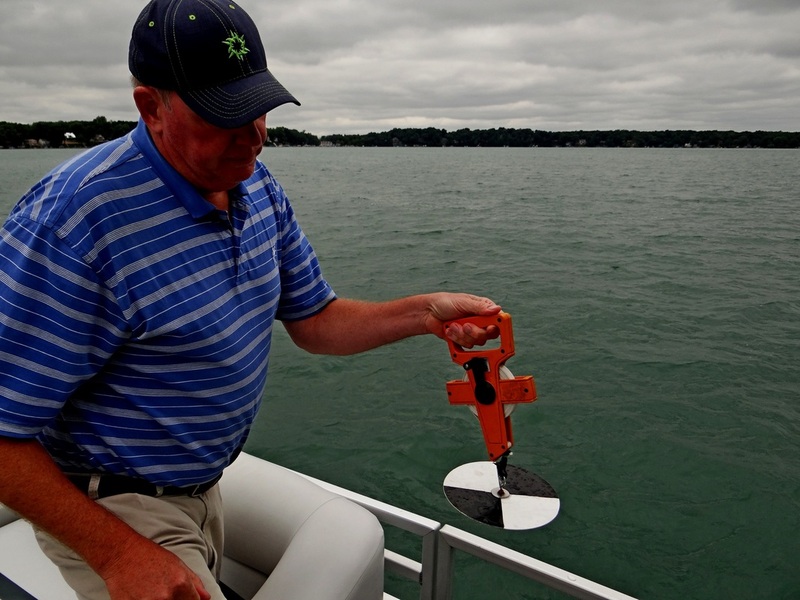 In a regional MLSA meeting held September 15th, we learned that virtually every lake in Berrien, Cass, Van Buren, St Joseph, and Kalamazoo counties have experienced large algae blooms in 2018. 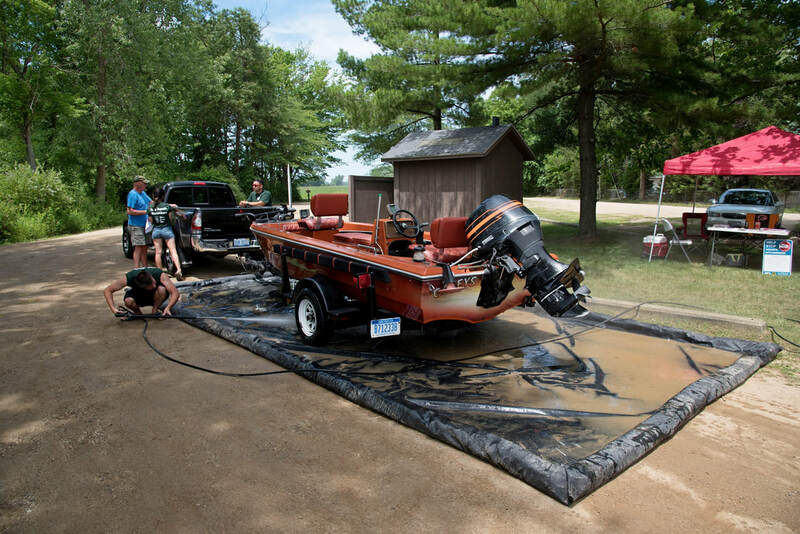 In addition to unusual rain and temperature patterns, we experienced atypical wind patterns on Klinger Lake in 2018, which may have contributed to some of the issues. We anticipate – and hope for - a more ‘normal’ year in 2019 and in future years. Please do your own research and share what you learn with your neighbors and members of your KLA board. We all share the common goal of ‘Keeping Klinger Lake Clean’. 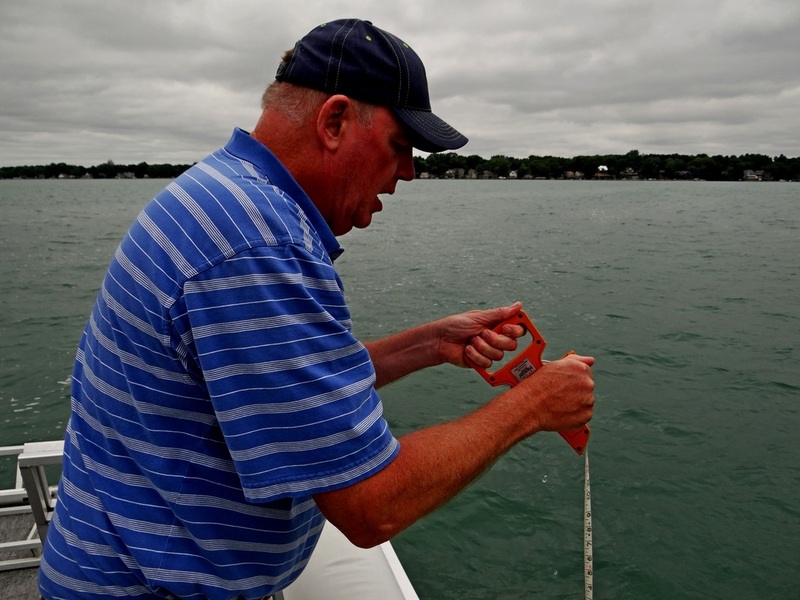 For many years, volunteer members of the Klinger Lake Association have monitored lake water for various parameters in an effort to protect this precious and valuable resource. In 2018, with the help of White Pigeon Township, the KLA is measuring Dissolved Oxygen (DO) and water temperature. 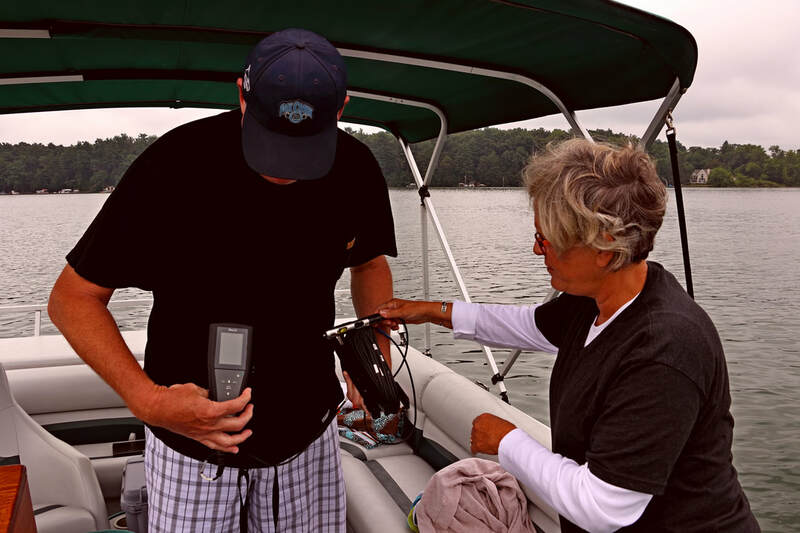 Every two weeks, volunteers, using a meter owned by White Pigeon Township, anchor in the deepest part of the lake and measure Dissolved Oxygen and water temperature at various depths. By tracking this information, we can continue to learn more about the overall health of Klinger Lake, both as a fish habitat and as a place for all types of water recreation. More information about what we're tracking and what it can tell us is available at https://micorps.net/lake-monitoring/clmp-documents/ under the Dissolved Oxygen and Temperature tab. 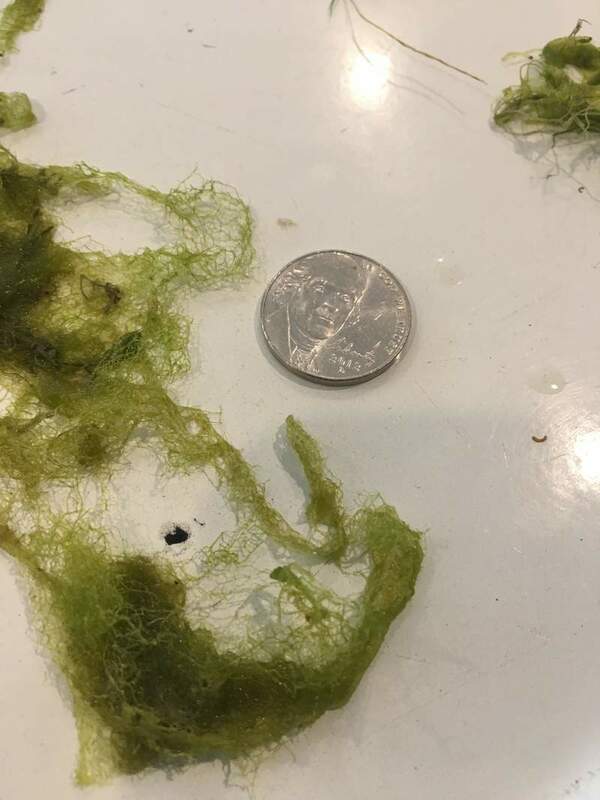 Over the past few days, I have been contacted by numerous lake residents expressing concern about the quantity of weeds floating near the shores of Klinger Lake. On Monday, July 9th, responding to a request from some Sandy Beach homeowners, I gathered plant samples off the seawall of a few cottages. I also stopped closer to the middle of the lake to pick up pieces of a couple of the floating ‘clumps’. I also used a few plant fragments from my own beach. Using a plant identification book I purchased at a conference of the ‘Michigan Lakes Stewardship Association’, I was pretty sure the two plants are not invasive species. To confirm, I contacted two experts: the author of the book and an MSU PhD. Together, they helped me identify the plants as ‘slender naiad’ and ‘water net’. The ‘slender naiad’ is a common, native, weakly rooted annual plant that is easily uprooted by boats or wave action. The ‘water net’ (so named because the arrangement of the plant cells) is a common, native, free-floating algae. The next question was ‘Why do we have so many this year’? Based on feedback from the MSU expert, both plants seem to be having ‘very good years’ in this area of the state. 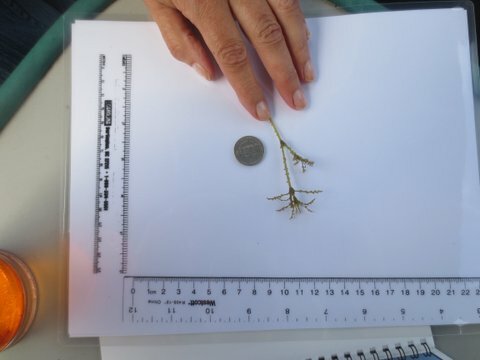 Both plants thrive when nutrient levels at the surface and in shallow waters are high, which is true this year because of unusually large rainfall amounts. We’ll continue to monitor the lake on a regular basis, focusing on controlling the non-native (invasive) species which threaten the natural balance. This summer, we’ll be treating a little less than 8 acres of the lake for invasive weeds, which is a remarkably low portion of the total, particularly in comparison to other lakes around the state. 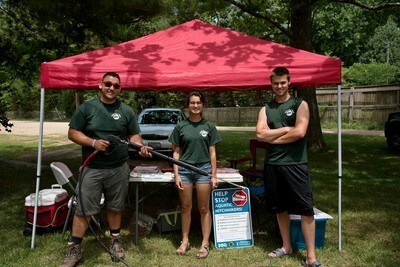 Three students from Michigan State University came to Klinger Lake on July 5th, 2017 to conduct a mobile boat wash in cooperation with the Michigan Department of Environmental Quality. The purpose of the boat wash was to remove aquatic "hitchhikers" from boats entering the lake to protect it from invasive species. Here are some pictures from the event. Click on the pictures to enlarge them. 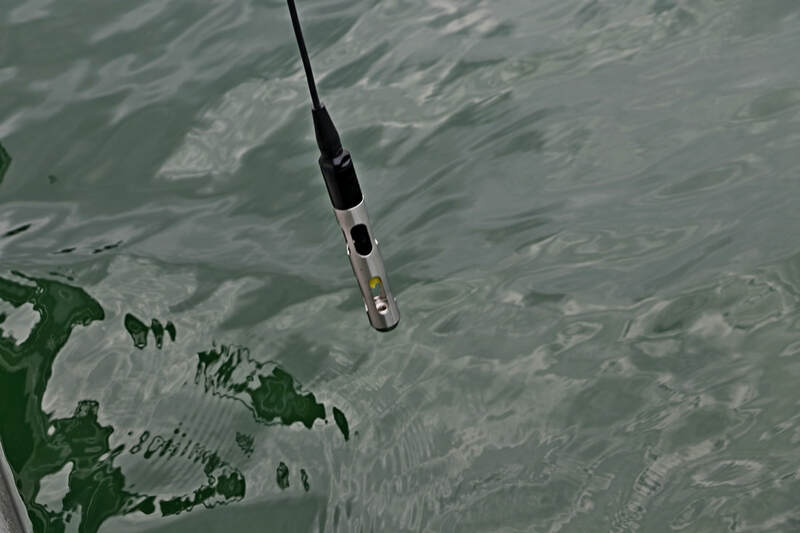 Each week during the recreational boating season, we measure the water clarity using a Secchi disk. 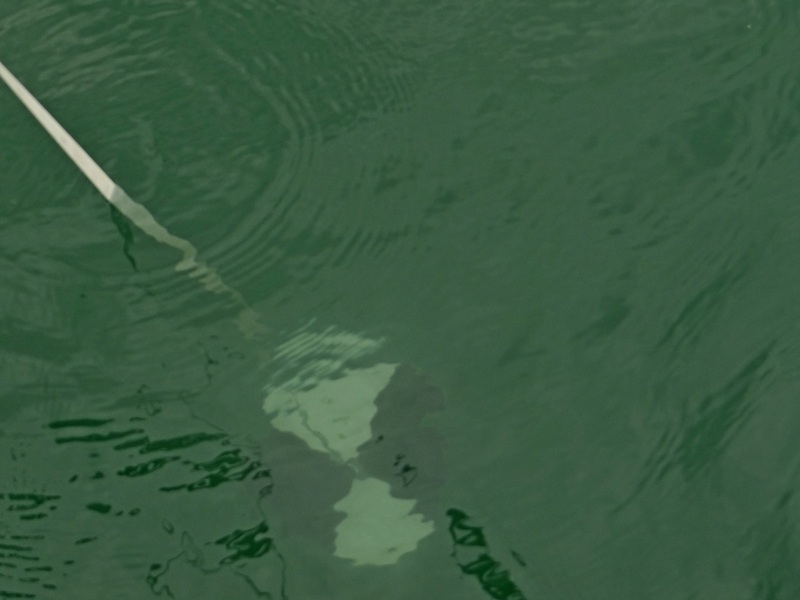 The testing is done by Mike Needham at the deepest part of the lake, which is more than 70 feet deep. The disk is lowered into the water until it can no longer be seen, and the reading is taken. The water temperature is also measured and recorded. Periodically, Chlorophyll concentration tests are done as well. See below for pictures of the testing. Please do not put grass clippings, leaves, or trash of any kind in the lake! Make sure your lawn service doesn't do this either. Buying fertilizer for your lawn? Make sure the middle number is "0" (No Phosphorous). If you are interested in seeing historical data on Klinger Lake water quality, which is based on measurements we take, it is available from the Michigan Clean Water Corps (MICORPS). Visit their website to view and/or download data on Secchi Disk, Phosphorus, Chlorophyll, Dissolved Oxygen/Temperature, Aquatic Plants, Exotic Plants (Invasive Species), and "Score the Shore". On their site, select Lake Monitoring >> CLMP Documents >> Individual Lake Reports. They are listed by county. Scroll down the page to St. Joseph County and then select Klinger Lake. New! View the water quality data for 2017 (the most recent report currently available). See the link to the PDF below. We look forward to another great summer of enjoying the treasure that is Klinger Lake. Let’s all work together to keep it beautiful for our children and grandchildren. These pictures were taken on August 28, 2015. The first photo shows Bob Puckett tossing the collection rake into the water. The second shows Suzi and Bob Puckett separating the collected material so we can check for any presence of invasive species. The third photo shows a sample being checked in detail against our reference material. The nickel is in the photo to show scale. -- Photos submitted by Mike Needham. 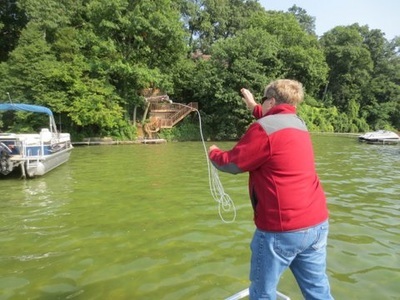 On Thursday, June 26, 2014 Klinger Lake hosted a group from the Michigan Department of Environmental Quality (DEQ) for a study of Aquatic Invasive Species (AIS). This study was part of a pilot program in which about 15 inland lakes in Michigan will be studied. 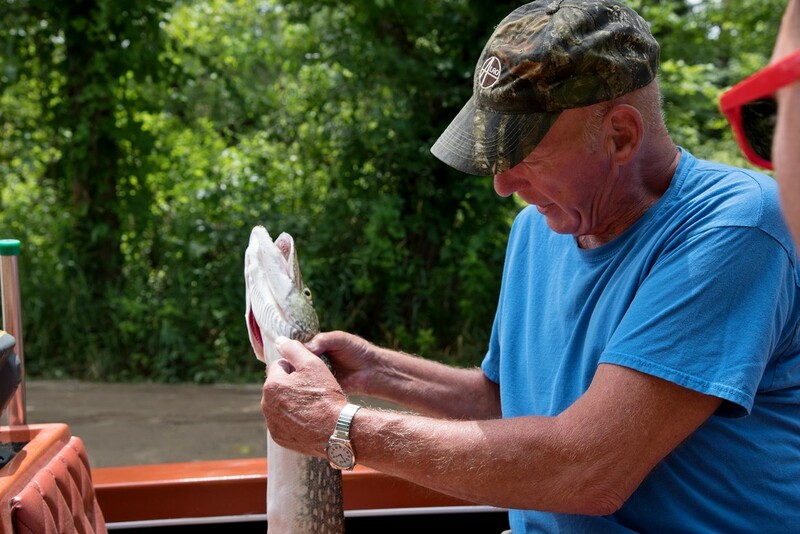 Klinger Lake was chosen partly because the Klinger Lake Association has a long history of working with the DEQ and other agencies to protect the quality of the lake, not because of any issues with invasive species. 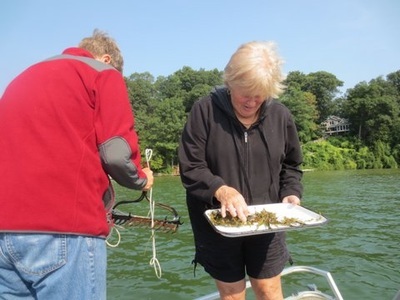 The primary activity on June 26th was a perimeter tour of the lake shore, with a marine biologist gathering plant material while snorkeling in 6 spots around the lake. The team also did 'rake tests', picking up plant material from deeper areas for further testing. In addition, there was another researcher gathering mussels and other aquatic species for further tests. The group included 2 people who manage a mobile boat wash station that was funded by a grant from the US Forest Service, as well as 3 people from MSU who are part of a long term research and development program that aims to implement technologies which will allow electronic DNA (eDNA) testing of lake water to determine presence of invasive species. 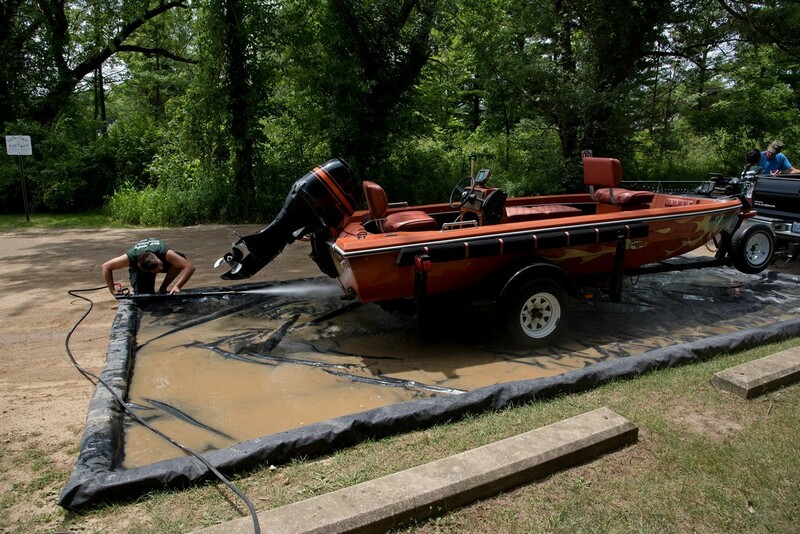 The KLA board has been working with the mobile boat wash program team to determine how we might host them at the public launch for a future bass tournament. 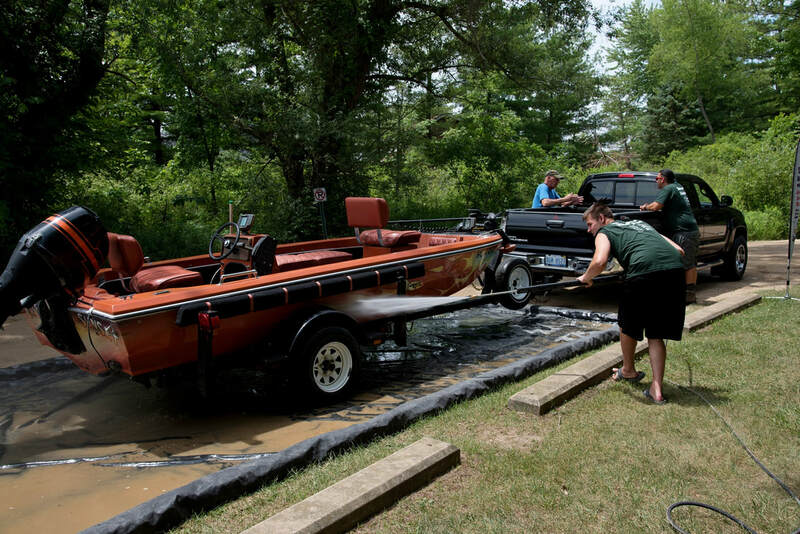 This would serve two purposes: 1) clean the boats that enter Klinger Lake that day and 2) educate the participants as to their responsibilities when they put their boats and trailers into this or any other lake. The eDNA tests represent the third sampling of Klinger Lake in the last 9 months. By gathering information on a frequent basis we can continue to monitor the presence and concentration of invasive species in Klinger Lake over a period of time. This can help all of us take early steps to attempt to manage any issues. We will be receiving reports from the team(s) that visited in June over the coming weeks and months. We will also be continuing to participate in monitoring and treatment programs designed to keep Klinger Lake healthy and clean. The Klinger Lake Association welcomed these visitors because the information gathered will help us in continuing the historically outstanding stewardship of the precious resource our lake represents. One of the reasons that Klinger Lake is so popular is that it is such a beautiful lake! Unfortunately, this popularity stresses the lake environment in various ways, which can result in degradation of the water quality. In this section of our web site, we'll report on some of the environmental issues affecting our lake and provide information that you will find helpful. Are you launching a boat at Klinger Lake? Please watch this YouTube video to learn how you can help prevent the spread of invasive species. Please help keep our lake clean and beautiful by telling your guests, renters, and workmen that no trash of any kind must ever go into the lake! This includes grass clippings, leaves, and other lawn debris. If you have a landscaping service, be sure to tell them not to blow any grass clippings, leaves, or debris into the lake! You can make your lawn a "natural lawn" by eliminating the use of harmful pesticides. Download and read "10 Steps to a Healthy Lawn" from SafeLawns.org. A portion of your Association dues goes toward treating infestations of Myriophyllum Spicatum, commonly known as Eurasian Watermilfoil. This is an extremely invasive plant that literally chokes the life out of a lake unless kept under control. Fortunately, Art Renner began a Milfoil control program here at Klinger Lake some years ago. As a result, our annual costs are significantly lower than those of other lakes in this area. Hydrilla is another exotic invasive plant that could threaten our lake. Click here to download a copy of the comparison card from Oregon Sea Grant that shows the difference between Hydrilla and Elodea, a native plant.